Can he rectify false weight whose own scales are uncertain? Can you enlighten your neighbor while you yourself have no light? PORT-OF-SPAIN, TRINIDAD/TOBAGO, April 8, 2019 (HPI by Paras Ramoutar): Even though Hindus came here 174 years ago from several parts of India, they still adhere to the basic tenets of Hinduism, one of which is the annual observance of Nau Raatri. Out of a population of 400,000 East Indians, of which 25 per cent are Hindus, Trinidad and Tobago has seen an unprecedented number of special Durga, Lakshmi and Saraswati pujas across the land. Several of the East Indian radio stations broadcast special messages highlighting the virtues and blessings by paying homage to the Divine Mothers. Devoted Hindus have been keeping vigil at homes and in mandirs glorifying the Divine Mother for Her unstinted love for humanity. Nau Raatri is being observed from Friday April 5 to April 14, while Ram Nowi will be observed on April 14, followed by Lord Hanuman Jayanti on April 19. And each of these observances will include religious incantations, bhajans and rituals. Nau Raatri is being observed with the same enthusiasm as the just completed Lord Ganesh Utsav which has become another major observance for Hindus. Whilst devotees pray for their personal wealth, health and total well-being, they are also seeking spiritual guidance in matters of global significance like weather change, earthquakes, floods, storms and other issues of international relevance. Mother Durga, Mother Lakshmi and Mother Saraswati are given equal reverence in the daily incantations. The 400 or so Hindu mandirs are holding nightly services as well. Pundit Ramesh Tiwari, spiritual leader of the Edinburgh Hindu Temple, said that the Hindu community has taken, "a new and novel approach in the observance of Hindu festivals and observances." Rajiv Malhotra: "Hindu Music Compromised"
BENGALURU, INDIA, April 8, 2019: Excellent video of Rajiv Malhotra's keynote address to a conference organized by Bharatiya Vidya Bhavan, Bengaluru and IGNCA Regional Centre, Bengaluru. We suggest started at about 2:50 where he discusses "the general problem of colonization." YouTube description: "Hindu performing arts are facing extinction due to rapid distortion in the name of modernization into Christian, Secular & Islamic forms. Famous persons like T.M. Krishna, Devdutt Pattanaik & Sheldon Pollock remove the sacred elements and contexts, and twist the meanings to serve political agendas. Our Swadeshi Indology series is working hard to produce research & publishing at the highest standards of scholarship. These game-changing works are later turned into consumer level products to reach the masses. I explain the difference between B2B (Business-to-Business) and B2C (Business-to-Consumer) as separate areas of focus, and how we are trying to institutionalize our movement. This was my keynote address at the recent Swadeshi Indology Conference in Bangalore on the Appropriation of Carnatic Music." UNITED STATES, April 5, 2019 (New York Times): Mindfulness -- the practice of using breathing techniques, similar to those in meditation, to gain focus and reduce distraction -- is inching into the military in the United States and those of a handful of other nations. This winter, Army infantry soldiers at Schofield Barracks in Hawaii began using mindfulness to improve shooting skills -- for instance, focusing on when to pull the trigger amid chaos to avoid unnecessary civilian harm. The British Royal Navy has given mindfulness training to officers, and military leaders are rolling it out in the Army and Royal Air Force for some officers and enlisted soldiers. The New Zealand Defence Force recently adopted the technique, and military forces of the Netherlands are considering the idea, too. This week, NATO plans to hold a two-day symposium in Berlin to discuss the evidence behind the use of mindfulness in the military. "I was asked recently if my soldiers call me General Moonbeam," said Maj. Gen.Walter Piatt, a commander of the coalition forces in Iraq, who was director of operations for the Army and now commands its 10th Mountain Division. "There's a stereotype this makes you soft. No, it brings you on point." The approach, he said, is based on the work of Amishi Jha, an associate professor of psychology at the University of Miami. She is the senior author of a paper published in December about the training's effectiveness among members of a special operations unit. The paper, in the journal Progress in Brain Research, reported that the troops who went through a month-long training regimen that included daily practice in mindful breathing and focus techniques were better able to discern key information under chaotic circumstances and experienced increases in working memory function. The soldiers also reported making fewer cognitive errors than service members who did not use mindfulness. Stop identifying with the world created by your mind and a new world will open up before you. UTAH, USA, April 2, 2019 (Salt Lake Tribune, by Peggy Fletcher Stack): In a land of fast food restaurants, strip malls and car washes, the new tower of the Sri Ganesha Hindu Temple suggests a world apart. The gleaming tiers of the 34-foot spire, bedecked with sculpted figures and gold cones, hint at what will greet visitors inside the nondescript gray, cinder block building -- a kind of heavenly city. Painted deities dressed in embroidered robes and silk tunics line three sides of the sanctuary, sitting under hand-carved sculptures that tell the stories of the Gods' incarnations. For Utah Hindus, it finally feels like home -- even for those who have never lived in South Asia but have nostalgia for the sights and smells of their ancestral abode. "Once you enter inside to see the shrines adorned," says temple President Satish Nachaegari, "it connects you to most temples in India." Devotees have enjoyed the temple since it was first consecrated in 2003 as a relatively small gathering space with the signature Ganesha statue, but the multifaceted individual shrines, iconography and tower did not fully take shape until after 2015, when it was rededicated. With the help of seven specially trained artisans, an Indian ambience emerged before their eyes. This enlarged and richly decorated space "fills a gap for our people," says Venka Subramanyan, who oversaw the beautification process, "not just immigrants but those who have been here a long time." Gliding quietly on the heated marble tiles or meditating in front of one of the shrines, worshippers in the growing community find a sense of joy. Many visit daily; others come weekly or on major holidays. They come for blessings before a test, before a big game, before a new project or performance, before a birth or marriage. JAFFNA, SRI LANKA, March 24, 2019 (Asian Tribune): His Holiness Bodhinatha Veylanswami, 163rd Head of the Nandinatha Sampradaya's Kailasa Paramparaand Guru at Kauai's Hindu Monastery - a sprawling 382-acre temple-monastery complex on Hawaii's Garden Island, was last Friday at Maviddapuram Kandaswamy Kovil, with a busload of his disciples and devotees from America to participate in the special puja held here. The American Hindu Chief Prelate, the largest and oldest Hindu Monastery in the Western world, participated in the homam (a very powerful Vedic ritual performed in the Temples of Lord Shanmuga, to keep us protected from all evil forces and lead a very blissful and devotional life). American Swamiji when speaking to Asian Tribune said that successive heads of the Hindu Monastery located in Hawaii, used to visit Sri Lanka since from 1969, to numerous Holiest Hindu shrines scattered all over the Island Republic. He said that there are Ishwarams (abodes of Lord Shiva) sung, venerated and glorified by Hindu saints of yore. He specifically said that his visit was the second one to the Holiest Maviddapuram Temple, located in Kanesanthurai, the western tip of the Northern Sri Lankan Peninsula. Maviddapuram, a Lord Skantha's Temple, located in Kankesanthurai, is older than 2500 years, and was constructed by the Chola Princess Maruthapura Veeravalli. Even in rags I am a God, fallen I am divine, high I triumph when down-trod, long I live when slain! BALTIMORE, MARYLAND, January 31, 2018 (Fatherly): Buddha once said of meditation that "it is better to conquer yourself than to win a thousand battles." It doesn't take much to understand the truth of this statement, especially when it comes to teaching stressed out little kids how to be mindful of their actions. For the past three years, the staff at Robert W. Coleman Elementary in Baltimore, Maryland have sent unruly children to the meditation room instead of detention. The unusual disciplinary method has seen remarkable results. Per a report about the program, kids who enter into the "Mindful Moment Room," go there to stretch, practice deep breathing, and various yoga poses. These types of acts relax the children and give them space to calm down and think about their feelings clearly. The Holistic Life Foundation, the nonprofit that operates the meditation room, makes sure that, in addition to getting students to engage in various physical activities, the kids who get sent there have an opportunity to actually talk about what they think was behind their dismissal from the classroom. The idea of sending kids to meditation and not punishing them with isolation is also a way to combat the negative and often racialized effects of school suspensions driven by various zero-tolerance policies. More than 90 percent of students in Baltimore City are black and Latino, and a majority of the students at Robert W. Coleman are also grappling with such stressors as neighborhood violence and the effects income inequality. At Robert W. Coleman, mindfulness isn't limited to troubled students. According to the same CNN report, at the beginning and end of every school day, all kids spend 15 minutes participating in a school-wide guided meditation session. BANDAR ABBAS, IRAN, March 20, 2019 (Mehr News Agency): Located near the center of Bandar Abbas, Hormozgan province, this Hindu Temple is one of the historical monuments built in 1892 through the offers of Indian merchants. The design of this temple is completely inspired by Indian architecture and is clearly distinguishable from other buildings of the city. Beautiful slide-show at "source". Many Western ideals and goals are based on the underlying attitude that there is only one life--so we had better do everything we can in this life. We had better achieve God Realization in this life, just in case. The Hindu attitude, based on the confidence that we have many lives, is: "I know I'm coming back; no rush. I will do as much as I can in this lifetime, and there will be ample time for further advancement." 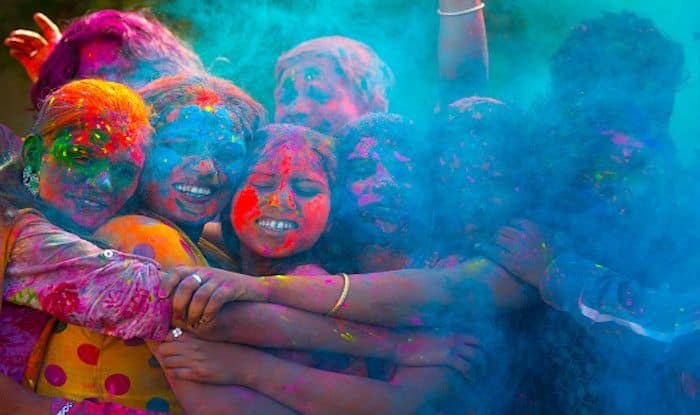 INDIA, March 18, 2019 (India): Holi is an ancient Hindu religious festival celebrated throughout India in the month of March. It is a celebration of good over evil, and the onset of summer all rolled into one. Legend goes that Holi also celebrates the immortal love of Krishna and Radha. People play with colors and flowers on this two-day festival across India, and this year it falls on March 21-22. Vrindavan is perhaps where Holi is celebrated with the most gusto and fervor in India. The celebrations here are for the advent of spring bidding goodbye to the harsh cold winter season. People especially come together at the famous Banks Bihari Temple and smear each other in different colors while dancing to the tunes of the religious hymns. There's a Phoolon Wali Holi that happens where devotees are strewn with flowers by the temple priests and another unique celebration called the Widow's Holi where the widows are encouraged to play with colors. Barsana, Manipur, Udaipur and Jaipur round out the remaining top joyous Holi celebrations. 8. The Treasure Trove of Siddha Manuscripts (in Tamil); 2014. Dr. Ganapathy was previously a Post-Graduate Professor and Head of the Department of Philosophy, RKM Vivekananda College, Chennai. Subsequently, he was a visiting professor at the Sathya Sai Institute of Higher Learning (Deemed University), Prasanthi Nilayam, Andhra Pradesh. He has participated in a number of national and international seminars and conferences. His publications include: Perspectives of Theism and Absolutism in Indian Philosophy (ed. 1978), Mahavakyas (1982), Bertrand Russell's Philosophy of Sense-Data (1984), The Philosophy of the Tamil Siddhas (1993). In recent years he wrote and published an English translation of the Siddha Civavakkiyar's Civavakkiyam with Dr. Geeta Anand. Never think there is anything impossible for the soul. It is the greatest heresy to think so. If there is sin, this is the only sin: to say that you are weak, or others are weak. 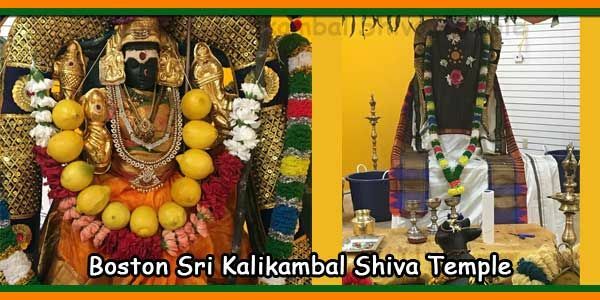 BOSTON, MASSACHUSETTS, February 8, 2019 (Lokvani): In the heart of Chennai is located a popular centuries old temple known as Sri Kalikambal, where Goddess Mother Kali in her benevolent form of Kalikambal showers divine grace on Her devotees. The temple was visited by the great Maratha Emperor Chhatrapati Shivaji in 1677, and was frequented by the great Tamil poet Subramania Bharati who composed many well-known songs in praise of the Goddess of this temple. Two centuries later, thanks to the untiring efforts of Shivacharya Bhairavasundaram, the presence and blessings of Mother Kalikambal in our midst. Shri Bhairav has established a beautiful temple for Mother Kalikambal in Bellingham, MA. The people of Greater Boston are very fortunate to have among them Shivacharya Bhairav, an alumnus of the Madras Sanskrit College, and an experienced and highly respected priest well-versed in the spiritual traditions of Hinduism, who is well-known in the area, and who is also closely related to the spiritual custodians of the Chennai Kalikambal Temple. 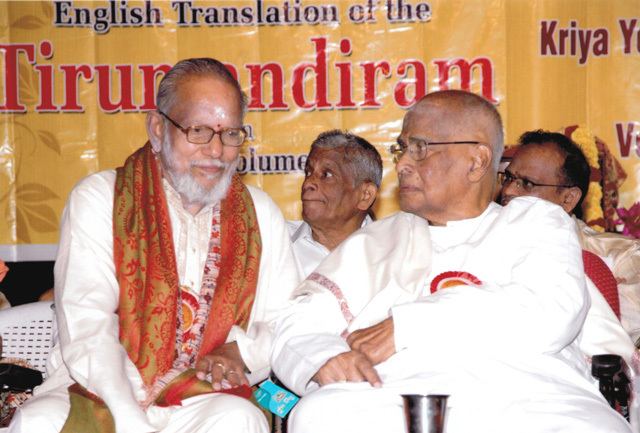 In fact, the late Guru Deiva Shri Dr. Sivasri Sambamurthy Sivachariar of the Chennai Kalikambal Temple was Bhairav's primary mentor and guide. His son and disciple Guru Swami Sathasivom Sivacharyar of the Chennai Kalikambal Temple continues to mentor and guide Bhairav in his mission, and sets aside time to visit the Boston Kalikambal Temple to participate in important events. The Boston Kalikambal Temple is currently housed in temporary premises that is part of a shopping plaza on North Main Street in Bellingham. Bhairav recently announced that the acquisition of land on which a new temple will be constructed has been successfully completed. More on this temple at "source" above.